I lived in Alaska in the mid-’90s but kept my airplane on the northwestern side of Tucson at the Avra Valley Airport. Known as a fun sport aviation airport, it was the epicenter of the local aerobatic scene, with an aerobatic box right next to the airport. Home of IAC Chapter 62, Avra Valley was the winter training site for the Red Baron Pizza Squadron and their famous red-and-white Stearmans, a boneyard for old firebombers and site of the landmark Skyrider Coffee Shop. It was pretty much all you could hope for from an airport. The road out of town into Avra Valley was a long straight stretch of freedom. There were no fences or gates at the airport then, and during the day in between flying, our gang would hike in the desert, target shoot and drive fast. At night we’d head to Li’l Abners, a cool “rustic eatery” with steaks burning on an open fire and a CW band. My daily routine consisted of going to the airport, doing some paperwork in my hangar office, flying in the box and doing it all again, with plenty of time in between to hike and explore the local area. I started to get to know the folks at Marana Airpark when I brought my parachutes over for repacks. 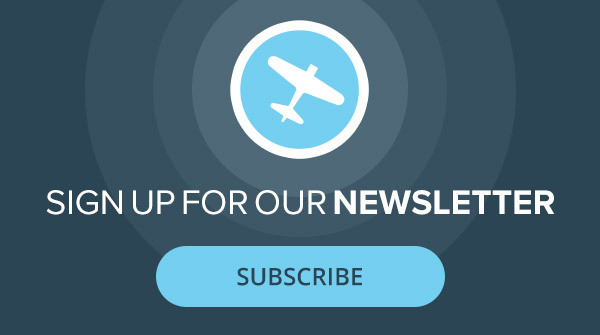 Just north of Avra Valley, Marana Airpark is a story in itself, a place of mystery and secrets. Starting out as a WWII Army Air Field training thousands of pilots, during Viet Nam it became the base of CIA operations Intermountain Airlines and Air America. In 1960, Del Smith bought Intermountain Airlines and used their assets to start Evergreen Airlines, basing its 747 cargo fleet at Marana Airpark. There was an aura of excitement and mystery at Marana and I used to buzz over for a visit—by airplane or motorcycle. Everyone knew me and would wave me in the guard gate, or pull open a hangar when I taxied in to keep my airplane out of the sun. It was also still a Federal Law Enforcement Training base and there were a lot of very buff guys jogging around; at night CASA’s would take jumpers up for HALO (High altitude, low opening) jumps. Fences were scarce and we had the run of the place to explore. There was a lot to see, but I only had eyes for what was inside the big tan Quonset huts, the airport’s best secret—a beautiful collection of fully restored WWII “warbirds.” “Evergreen Ventures,” the name of the warbird collection, was the vision of Del’s son, the late Mike Smith, an ANG F-15 and Pitts pilot. The collection’s centerpiece was an ex-CIA and ex-fire bomber B-17G, and a superb collection of warbirds including a P-51, Spitfire, P40, TBM-Avenger, T-6 and more. Run by Bill Muszala, the collection was fully operational, well maintained and ready to fly. The author in front of the Evergreen T-28B Trojan at Marana Airpark just north of Tucson, Arizona, in the early 1990s. I had always wanted to fly a WWII airplane since the first time I saw a P-51 at an airshow in Fairbanks, Alaska, but the prevailing view by warbird operators was that they were a man’s airplane and too “heavy” on the controls for a woman to fly. What about the WASPs who flew every airplane in the inventory? The response was always, “They were only ferry pilots. Women couldn’t fight in them. The stick forces get really heavy when going fast so aerobatics is out of the question. Women couldn’t be fighter pilots.” How could that be true? It made no sense and I never believed any of it. So I kept my eye on the collection’s silver P-51 but knew if I had any chance to fly these airplanes at all, I would have to start in the T-6/SNJ, almost always the starting point for a warbird pilot. I made my case and Bill Muszala agreed. Bill said there would be resistance to putting me right into a fighter, but he needed an instructor and said he would train me in the T-6. I would be training the guys who would be flying the fighters, who needed training to transition from conventional to tailwheel airplanes. Hence, I got my start in flying warbirds. 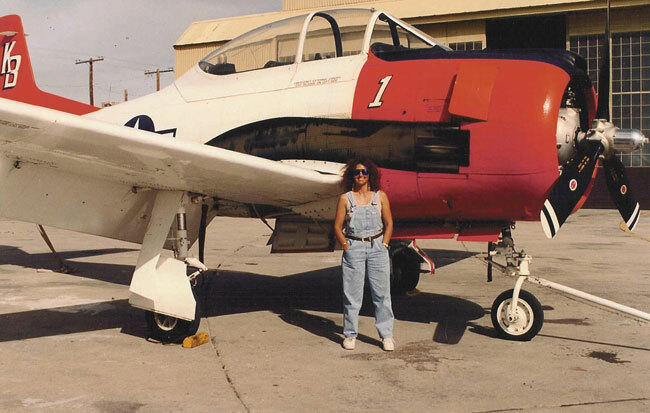 In 1993, I had been competing and flying airshows full time for seven or eight years, was already a two-time National Aerobatic champion and had extensive experience in taildraggers and bush flying, plus flew helicopters. I wanted a challenge and was ready to branch out, and I knew my aerobatic experience dealing with energy management of complex sequences of maneuvers, flying airshows in the low-level environment, and experience with maintaining situational awareness gave me plenty of experience to move into heavier airplanes. We started flying the T-6 with a couple of front seat flights, then I switched to sitting in the back seat, the perch from where I would be instructing. Bill also spent a lot of time teaching me about operating radial engines, an art in itself. Other than having to carry a cushion or two to sit forward enough to reach the adjustable rudder pedals, there was nothing unconventional or really difficult about flying the T-6, and with Bill’s coaching, I was soon ready to start instructing others. My first students were friends of Mike Smith’s, F-15 pilots from Mike’s ANG base. Obviously talented pilots but with no tailwheel time, but were quick learners and it made the training fun. Of course, as part of the training we did aerobatics, and after discussing it with Bill and getting some additional training myself, I set up an extensive spin training program in the T-6, which I thought was important for the guys because as soon as they were up to speed and confident in the T-6, they would move into the P-40 and the P-51. At this time, Bill needed help instructing in the T-28B, so I got checked out and started training some of Evergreen’s 747 pilots who, for the most part, weren’t tailwheel pilots. The T-6 has the reputation of being a handful but it’s a great trainer. It’s honest and predictable in all attitudes, and it demands a lot of the pilot because it doesn’t tolerate sloppiness on the ground or in the air. As far as being a “man’s” airplane, there were times I used two hands during aerobatics, mainly to keep the controls centered or for spin recoveries, which I insisted on so the students wouldn’t add aileron input, but the rest of the time I flew it with two fingers. Later on when I had my own T-6, I flew some airshows in it. I guess you could say the T-6/SNJ is a “manly” airplane in the sense that it’s big, belchy and blows smoke, but it’s every bit a “woman’s” airplane, too, and don’t let anyone tell you otherwise. Soon I started flying the T-6 to airshows with the guys. I loved flying the rumbling beast solo over the desert and the gray, weathered and worn WWII aux airfields. Even at 10K, I could see ghosts of airplanes parked on the weeds growing through the cracks in the cement. I kept flying the T-28B, giving instruction and a ride every so often, and then was offered a TBM Avenger type rating, which I jumped at and still have listed on my pilot’s certificate. Fighters eluded me until much later, but I eventually worked my way into flying airshows in the P-51B and D Mustang. Somehow I was able to wrestle those manly controls! I can tell you firsthand that at 5’3” tall and 115 pounds, I can put a P-51 in a dive to 300 knots, pull to vertical and do a roll, all with one hand. Fighters not designed for women? Sure, they are. Bring them on! Avra Valley Airport now has a “corporate”-sounding name and there is a tall fence and several gates surrounding the airport. Access isn’t quite as easy as it used to be and probably neither is the fun factor. We used to have a lot more freedom; things have gotten so serious. TSA is protecting us from ourselves, I guess. The summers were too hot to fly in Tucson so I moved to Florida to be closer to the ocean, but I always miss those Avra Valley days. I’ll never forget my last drive to the airport in my Corvette to pick up some last-minute things from the hangar. I was almost there, cruising at a respectable 120 mph, when I saw my radar alarm start flashing. Busted! A police car was hidden behind a concrete barricade. I had never gotten a speeding ticket in Avra Valley before. Things are starting to change, I thought, it’s a good time to be moving on. I hit the brakes, slowed down, and waited for the lights to come on, but instead, a hand reached out the car window and signaled to me with a finger, “Slow down!” That pretty much summed up my Avra Valley experience. Thanks to whoever you were for helping keep the memories of those days alive and as the most fun I’ve ever had. Patty Wagstaff is a 3-time U.S. National Aerobatic champion, and one of the world’s top airshow pilots. Visit pattywagstaff.com/school.html or reach Patty via email through [email protected]. Want to read more from Patty Wagstaff? Check out our Let It Roll archive. Great flying stories Patty keep em coming! Thank you Patty for sharing your life with us. You have an amazing gift for flying and writing. I didn’t look at who wrote the story still the end. As I got more into the article it was obvious it was Patty. Good read Madam. Thanks for the memories! I got checked out in my Extra with Brian Howard out of your former hanger a few years after you left. I sure enjoyed looking at all the stuff you left behind–in the way of posters and other stuff on the walls. I too used to enjoy Avra Valley before the fences and it was one of my favorite hops from Tucson for breakfast at that wonderful airport restaurant. I even remember back when it was ok to land at Pinal but not to get out of the plane. It was a wonder time that I’ll never forget. “Desert Warbirds Days” was a superbly written story about the then and now of the aviation community, and the sexism that was rampant back then. Hopefully never to reappear again. Thanks for enlightening us Patty.